The Laboratory of Ecological Engineering and Technology of the Democritus University of Thrace (DUTH) announced the opening of ODYSSEA-Greece platforms on Facebook and Twitter. Initially focusing efforts on providing vital information to the mussel farmers located at Keramoti Bay in Kavala Gulf, the ODYSSEA-Greece platforms have added the two other major concentrations of mussel aquaculture in Northern Greece – Nea Makri and Chalastra – within its first ten days. The platforms are the beginning of a wider effort to bridge the gap between science and local end-users, and serve the data-gathering needs of businesses operating at sea, by sharing real-time data that can help the fishing and aquaculture industries significantly improve their performance. The Greek platform is essentially a pilot serving as an initial testing ground for the Mediterranean-wide data dissemination framework that the ODYSSEA Project is developing, organisers stressed. Nine regions across the Mediterranean are expected to set up their own social media channels to link with local end-users by September 2017, and the overarching ODYSSEA platform is set to be unveiled in June 2018. “Similar services may be initiated at all ODYSSEA observatories (and beyond) to cover hot-spot areas of the Mediterranean Sea and develop an active community of end-users ready to use the ODYSSEA Platform once it is ready,” noted ODYSSEA Coordinator Prof. Georgios Sylaios, of Greece’s Democritus University of Thrace. Only days after launching, the ODYSSEA-Greece Facebook platform has already gathered more than 250 users who have liked or followed it, “and we expect to have more as more areas of interest and more parameters are added,” Prof. Sylaios said. ODYSSEA-Greece provides sea surface temperature measurements obtained from the EU’s COPERNICUS system satellites, and forecasts about next-week’s sea surface temperature evolution from COPERNICUS system predictive numerical models. Measurements and forecasts of the air temperature (mean, minimum and maximum daily values) are relayed from the US National Oceanic and Atmospheric Administration’s Global Forecast System (GFS). Both the measurements and the forecasts will be presented in the form of a diagram and explanatory text updated daily, together with a summary of wave direction and height and other critical data, for the benefit of mussel farmers and additional end-users. Information on additional parameters, such as waves at sea, currents, concentration of phytoplankton, and more – will follow shortly. The ODYSSEA-Greece social media initiative has attracted the interest of other local Blue Economy sector stakeholders. After a meeting with the Kavala Port Organization, DUTH has engaged to examine the possibility of providing tailored integrated information services that can support both well-established port activities and newly emerging ones. 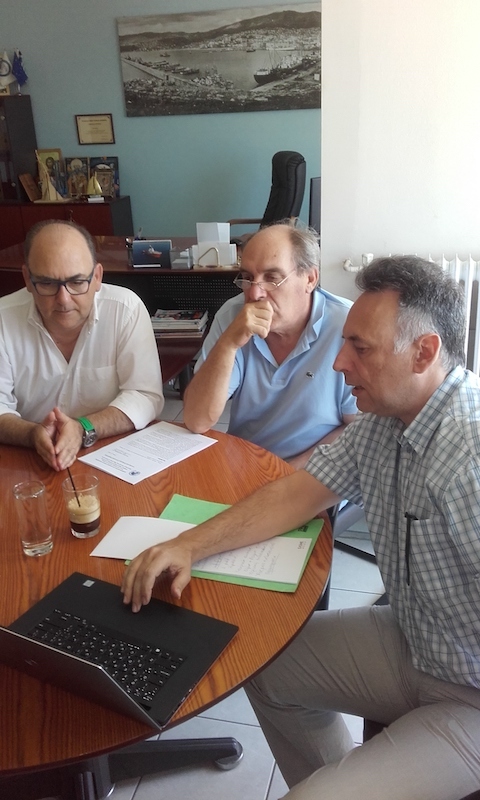 Project Coordinator Professor Georgios Sylaios and representatives of the Kaval Port Authority meet to launch the new platform.